A few months ago, I got an email from someone who was really bothered by the fact that I don’t always make tortillas from scratch. This person felt I’d save so much money by doing so and they were kind enough to pass along their tried and true recipe. While I very much appreciate the input from this reader (I learn so many amazing things from you all and am constantly challenged by your frugal ways! ), I have to disagree with her that I’d save a lot of money by making my own tortillas. Your prices might be entirely different, but here in Kansas, we can pretty routinely pick up a package of 8-10 tortillas for around $1. When I priced out the ingredients of homemade tortillas, I figured up that it would likely cost me around $0.30 to $0.40 per batch. So yes, you could say that homemade tortillas are slightly less expensive than store bought tortillas. However, you forgot to factor in one very important part of the equation: TIME. To make 8-10 tortillas from start to finish would likely take me around 30 minutes. At that rate, I’d be spending 30 minutes of my time to save around $0.60 to $0.70 total. I could probably figure out a way to make them more efficiently if I did a bigger batch, so let’s say I became the world’s fastest tortilla-maker and I could whip out 70 tortillas from start to finish in an hour. At this rate, I’d still only be saving less than $5 for an hour’s worth of work. If your family loves homemade tortillas, or you don’t want to eat some of the ingredients in store bought tortillas, or you love making tortillas, or you go through seven packages of tortillas a week and the least expensive you can find them in your area is $4.99 per package, then by all means, make homemade tortillas. But, don’t do it merely for the cost-savings because, unless you live where tortillas cost $7 per bag, the savings per hour is so slim that your time would very likely be better spent elsewhere. It’s imperative, in seeking to be better home economists, that we value our time as well as our money. It is easy to get so caught up in trying to pinch every penny, that we lose sight of the big picture. We can become so focused on trying to save money that we end up spending hours and hours and hours of time to save a mere few dollars. Personally, if I’m not saving at least $20 per hour by implementing a particular frugal practice, than I’d rather invest my time elsewhere. Of course, this rule doesn’t apply if it’s just something I really enjoy doing. However, if I’m doing something primarily for the money saved, then it is important to me that I’m actually saving money! If you feel like you are spinning your wheels and going nowhere when it comes to saving money, I encourage you to stop and consider how much money you are saving per hour in your various money-saving activities. If it’s below minimum wage, it’s probably time to go back to the drawing board and find some other money-saving practices to implement which will give you a better return on your investment of time and energy. After all, time is money, too. I’ve had the exact same thought as you regarding tortillas. I can buy them freshly made at Kroger for a song. OR, I can spend a lot of time making them myself and being dissatisfied because even with a tortilla press, followed by rolling them out, they’re still thicker than I’d like and taste too doughy. Kroger has freshly made tortillas? oh my, will have to check my store out! @chrys, It’s only at Kroger Signature stores, and it may be a Texas thing. We’re BIG on Tex-Mex down here. To be honest, though, I buy tortillas frequently, too. I only make them when there are none in the house, and we need to stretch supper to feed another person or two. They are great quick breads to add another dish to the table. My first thought on making anything from scratch in my case is how much am I going to waste first just getting the hang of making it. Not everyone is talented in making things from sctach. This is the main reason I coupon to the extreme! I can run down a coupon but I can’t make anything but great cookies for some reason I make amazing cookies but cooking not so great ! I must admit I’ve never conquered the homemade tortilla yet! I want to though . . . it’s on my list when I feel up to it. But you are right, I would want to make a ton so I can freeze some if I’m going to spend that much time on them! I agree that it probably doesn’t make financial sense to make your own tortillas, but I just like the taste of homemade tortillas better than store-bought ones and I’m wondering if your reader might share the recipe with us? Thanks! Scroll down a tad bit and you’ll see it. @Jessica Lynette, Thanks so much for the recipe! I’ll try it when I have some time on my hands. I think my son will enjoy helping me roll out the dough (for the first couple tortillas anyway!). Many hanks! Amen! Crystal, it is so easy to get wrapped up in “saving money” that I can run myself ragged shopping 4 different drug stores and 3 different grocery stores. My peace is worth something too! Each woman must look at her needs and how she can best serve her family….and for me, it is often skipping a good deal and staying at home more often. You are on to something, Hallie! I, too, have found many unexpected blessings from staying home more: serenity, savings, getting more done around the house, enjoying quality relationships with family & neighbors, contentment, etc. I have learned through experience that I need at least 2 at-home days a week. More, or consecutive days, if possible. The taste and health issues are also big for my family… we make ours with freshly milled wheat and I don’t think I’ll ever go back. Aside from all of that, we find that when we make tacos, it takes 30 minutes anyway to make the meat, wash the lettuce, shred the cheese, etc. Making tortillas while this is happening really doesn’t add much time, if any. And I get to interact with my kids, at home, while I’m making them. One day I hope they will even help me make them! I should add that we invested in a tortilla press, which makes flattening the tortillas a little quicker. :-p I am so very bothered that you didn’t fall in love with the taste of home made tortillas. I hate how much I love them, and other than for breakfast burritos which we make in bulk, I find I can’t buy store bought because I have fallen for the homemade taste. But it’s my goal to make my kids expert tortilla rollers, thus saving time and pennies. Time wise I can make 24 in about 30 min. Sometimes daughter rolls (they don’t end up the roundest, but oh well) and sometimes she cooks them, but I fell in love with the taste so I make them. They also only go on sale for $1 a pkg around here one every 3 months so I do save a little bit more then you do and of those 24 half go into the freezer for the next meal which is usually the following week. Amen! Your tortillas look like mine. I have found it not to be worth my time either. Buying this one item is better for me than making them. Less stress too! I came to the same conclusion after making a batch of homemade tortillas. Yes they were good, but I wasn’t good at making them and it took me a long time to save just a little bit of money. I am right there with you !!! I work full time so valuing my time is very important to me! I do prefer to cook from scratch whenever time permits but I’d just as soon but tortillas as to make them! My sanity is worth something! @Lisa, I think that’s a really good point about taking into consideration not only time but sanity! If I hate doing something, if it’s something that doesn’t come naturally to me at all and I find to be a frustrating hassle, it’s probably not worth doing unless it’s saving me a significant amount of money. @Shari B, I totally agree about making cookies from scratch. I think there’s a therapy in baking cookies and you know just that one nostalgic comfort food will always be appreciated by your family. It may be the same for tortillas for that woman’s family. I live in AZ, and they take making tortillas and tamales from scratch serious business. Same thing with my Italian mother-in-law and tomato sauce. I think every culture has their “thing” they insist is better made homemade. I love how you broke it down 🙂 But, as a “cook”, I’d still like a foolproof recipe for tortillas so when I’m out and I have just the right leftovers and stuff where I’m thinking, “I wish I had some tortillas, but I don’t want to go out to the store AGAIN.” That’s when I think it would be worth doing on your own, and I’m sure the ingredients (similar to crepes) are common pantry ingredients. If you’re making homemade tortillas, I definitely recommend a tortilla press – much faster than doing it by hand – and also, we use masa flour. It’s corn flour and almost always found in the mexican food section at the store – NOT with traditional flour!! It’s $1 and some change for a 4-lb bag at Walmart and it makes delicious corn tortillas. We fry them in some EVOO to get the crusty exterior, yet a soft cornmeal interior. So what’s your recipe, Megan? @Kristin, We follow package directions (I believe it’s no more than mixing the masa with water), however we add a couple teaspoons of sugar for a sweet corn taste. They’re absolutely wonderful and taco night is definitely my favorite dinner! I’ve been eating homemade tortillas all my life. And now, I make them. You are right though, they are a lot of work! Because of that, we don’t eat them very often. I don’t care for the taste of store bought, so we just don’t eat them but a couple of times a month. Since I do make them regularly, I did invest in an electric tortilla press, which totally cut down on the time I spend cooking them. That and a griddle that cooks 6 at a time. But, you’re totally right. I wouldn’t be making tortillas to save money. They are too time intensive for that. I make them ’cause they’ve been a family tradition for generations, and that makes it worth it to me. I have come to learn that with frugailty, the balance is crucial. I found an electric tortilla press at a yard sale for $2. I use it all the time!! It’s faster than rolling and then cooking. My family prefers homemade tortillas and I like to make them. I can see how they’d be a chore if it wasn’t something I enjoy doing. The only problem is they aren’t very BIG — more like taco size. Store tortillas are yuck yuck yuck but homemade tortillas are a pain to make. WE do homemade for parties, “special” foods (burritos don’t count) and other times when we just can’t stand the taste of store-bought once again. Or if I get bored. It really has nothing to do with the price – I can normally get tortillas for free or close to it, especially recently with all the Mission coupons. There is one factor not figured in here: Health! Almost all those store bought tortillas for $1 per package are made with enriched bleached flour and hydrogenated oils (trans fats). I’m sure that you can make a homemade tortilla that would be much healthier for your family, despite taking a bit more time. @Kelly, Yes! I forgot to mention that in my comment…when I make flour tortillas, the only ingredients are flour, baking powder, salt, lard (yes, better for you than vegetable shortening/oil), and water. Much, much better for my family than all the nonsense in storebought tortillas! I agree here. Health is a BIG factor. I was making the homemade tortilla case to a freind yesterday so it is funny that this was posted today! The list on the Aldi brand was much longer than flour, salt, shortening. It has to be bad for you when they add so many shelf stabilizers. You might remember that they were once in the refridgerated section, now are on the shelves. I absolutely agree. I make tortillas not to save money, but because I don’t like to feed my family store-bought tortillas. The taste and texture are wrong, and there’s yucky stuff in them that’s not worth the money savings. @Kelly, that’s the biggest reason I would make tortillas too – I don’t all the time, but I have – and love the taste versus store bought – I am hoping to make them more this winter! And maybe try making a bunch all at once and freezing them and see how that works. I absolutely agree that homemade tortillas are better for you. However, they are not less expensive. So if you are only making them to save money, it’s likely not worth your time (unless you live in Alaska or something!). However, it might be totally worth it for you to make them if you want to be in control of the ingredients in your tortillas. For cost and health…Whole foods has great whole wheat and corn tortillas for around 1.50 per package and less for the corn. This is the best of both for me! Wish we could get them cheap here. Sometimes they are on sale for under $1.50 but usually they are $2-$3 a bag. Sad thing is this is Houston. I personally think they are taking advantage of the fact that we have such high demand for them here being that the majority of the population are hispanics and mark them up. The fresh ones at HEB and Kroger are $3 (and sometimes $3.50) per 10. My way around it to get the homemade taste without the work and time is to use Selecta brand tortilla mix. Kind of like Bisquick for tortillas. Mix, roll and done. To make 10 of them takes me about 5-10 minutes (depending on how many of my 4 kids cause trouble in the time I am making them LOL) and that only costs me $1.89 for a bag that makes 50 tortillas. I just cook them on my iron griddle on the back burner while I cook the meat and beans and no extra time spent. @Kristen Andrew, Yikes! I’m in Dallas, and the fresh ones at Kroger here are about $1.79/package of 10. I wonder why there’s such a price difference when we’re only 5 driving hours apart? @Kristen Andrew, My favorite tortillas are the HEB flour tortillas, which I get here in Austin for about $1/pkg (Maybe a few cents less. I love them. And that they last on the counter for a quick cheese tortillas. So I guess I need the preservatives. This is why I avoid homemade bread in general — it goes bad before I need it and I’m ALWAYS making bread. Thank you for figururing out the math on this one. Now I don’t have to feel guilty for not making my own tortillas anymore! THANK YOU for posting this, Crystal! Time IS money, especially with little ones underfoot. Everybody picks their battles. Thanks for putting yourself out there by saying that homemade tortillas is one of yours that you’ve opted out of 😉 Thank you for your wonderful blog and all you do! Hi Crystal, in reading this post I was reminded about a post you wrote back in August – about an epiphany you had to do more DIY items and “from scratch” recipes. You suggested you were hoping to work smarter, not harder. I have to agree, that there are many, many items that just make more sense to buy with coupons and sales than yourself. So sometimes DIY does not seem like working smarter to me. Do you really need to make your own laundry soap if you can get it super cheap with coupons? So…I’d be curious to hear how you reconcile these two posts? I’d love to hear your thoughts. As far as I know, there’s nothing to reconcile since my post back in August was about this very thing, actually. 🙂 That some things are worth doing yourself and making from scratch and others are not. That’s what working smarter, not harder is all about. Since then, I’ve been trying different do-it-yourself ideas and making different things from scratch to determine what’s really worth my time and effort and what’s not. For me, making most of our baked goods from scratch is smart because I can whip them up in no time at all and we save a lot of money by not buying packaged baked goods (plus, homemade baked goods taste so much better and are so much better for you). On the flip side (no pun intended! ), I found homemade tortillas to be tedious and time-consuming, so I personally feel like it’s not a good investment of my time and effort at this season of my life. @Crystal, I can’t agree more. Some things are worth doing for those who have talent in an area and for another person that same thing might not be worth doing from scratch. Evaluate your talents and time are very good lessons in life. Swap with someone if you have talent in one area and she has talent in another this can increase value time added as well. @Crystal, Got it!! Thanks for taking the time to clarify that for me!! That said, tortillas are a bit more expensive here–about $2.20 a bag. So I DO save money making my own (it takes me about 25 minutes of hands-on time, and I’m unpracticed–plus I like doing it). Crystal–I love ya, but have to disagree, mine come out WAY cheaper and so much softer and healthier, but totally understand there is a time and place for all things!! @Jamie, Would you share your recipe? I love making tortillas! However, I have to agree that they take entirely to much time! Maybe I could get better with practice but I’m not sure we eat enough of them to become uber efficient. We do pay a very pricey $2.14 for 10 flour tortillas here in Jacksonville, NC; maybe we will try some of the suggestions here. Definitely not a cost-saver when it comes to time, but oh man do they taste better! I tried homemade tortillas once. It was super simple (probably because the recipe came from a children’s magazine) and super delicious! They did take a little bit of time and turned out smaller than I like, but they are healthy and yummier. Still, point taken no one can do EVERYTHING from scratch, it isn’t practical in today’s world. Each much pick and choose which are the priorities. You took the words RIGHT OUT OF MY MOUTH. I make gooooood homemade tortillas. Amazing even. Little pillows of amazingness. And yet I make them only once in a blue moon. Why? 1. the expense! Like you say they really aren’t cheaper. 2. quite honestly I have ZERO self control over myself around homemade tortillas. I could eat an entire batch in a sitting. My motto is that I save where ever I can so I can spend wherever *I* want. I even make my daughter’s clothes! LOL. @Heather@Family Friendly Frugality, I eat at least 3 or 4 when I am making them, but they are SO good. I just eat less later. The taste is worth it! Totally melt in your mouth! I love the taste of homemade tortillas, and think that they are far superior to store bought. That said, since I’ve had two little kids and found great deals on decent tasting ones at Costco, I usually just buy them. It does trouble me, though, that they don’t go bad for a really really long time . . . I do think, however, that there is something to making things from scratch, even if it’s not to save you the most money. Our generation is quickly losing basic skills (like sewing, baking/cooking from scratch, growing their own vegetables, etc.) because it financially doesn’t make sense. I get that as a busy mom of little ones on a tight budget, but I also know that when I do take the time to make something from scratch, there is value in it in several ways. I learn a skill, and usually get better as I go along, there is a more personal connection between the food I serve and the people I serve it to (my sons will have memories of me making things for them instead of opening a package), and I just feel better about myself when I learn how to do new things. I’m glad that you touched on the idea of how much time something is costing you, though. I’ve wondered about this when it comes to taking surveys. For the ones I manage to qualify for, they often don’t pay that well. For example, I might get $1 for a 15 minute survey, but that only amounts to $4/hr savings. I, too, think there is value in learning to make something – and even learning to enjoy it – just for the sake of knowing how to do things yourself. I love rolling out bread dough – or tortillas, with my children. Is it worth my time? Maybe not. But would it be a better deal to buy my tortillas cheap at the grocery store (which I do sometimes) with my four little bored children in tow? If I have a choice, I would pick spending time with my children teaching, talking, and demonstrating how good food can be made by hand and with love. But I do understand that we do have limits to our time and need to decide what is best for our family. @Jenni @ Life from the Roof, itotally agree. I am 29 and I can grow a small garden, bake bread and can salsa. And I am probably the only one I know of my generation that does! Also the ‘going to the store ‘ factor. If I can whip up okay tortillas I can stretch my store trips and time out of my day. I love making things from scratch, too, and I think there is definitely value in that and in teaching our children those skills. And I was thinking of surveys when I wrote this post. I always think of the time involved for the money earned and how much I’m earning per hour while doing those kinds of things in evaluating whether or not it’s worth it! Our Kroger makes flour and corn tortillas fresh daily and they are delicious!!! Until I can make them like that (which, I’m trying!) I’ll probably keep going back for Kroger’s tortillas! I really like this post. For me, I don’t make every single thing from scratch just to save money. If I did, I would have no time with my kids. I think people put too much pressure on themselves to do everything perfect: saving money, making everything by hand, or making sure every single thing we eat is the healthiest thing available. I would be exhausted after this! I’m glad you’ve shared that it’s okay to have limits. I agree. And I have a hard time making the tortillas the right thickness and shape, so it takes even more time. I buy tortillas at whole foods, I look for kinds without soybean oil. I often get the ezekiel brand (frozen). They’re not much more expensive than regular freshly-made tortillas. I do make my own pizza dough (triple the recipe and freeze 1 pizza sized portions), it’s easier than tortillas and seems to save money. too funny. Sometimes I make my own corn tortilla.. but not for the cost savings.. but for the enjoyement. I love those little suckers. Since I don’t have a tortilla press I roll the dough in little balls and pound them out with a glass.. not the simplest method..
I’ve found success in divindng the dough into balls, rolling each ball out into a little circle, letting them rest for a bit, then rolling one out to tortilla size, put it in the pan, and roll out the next one while it cooks. I have a super-easy recipe for homemade tortillas – just mix whole wheat flour, salt, water and olive oil, roll out (my kids love to help with that part) and cook in a skillet for a minute or so on each side. It goes really fast, especially if you have 2-3 skillets going at once, and I can get a couple dozen made in less than half an hour from start to finish. They are so much tastier than store-bought tortillas and so much healthier, too, so the little bit of effort is worth it to me. I made homemade tortillas once. It was a fun experiment, but in the long run, the time + the mess + the work involved didn’t seem worth it to me. And honestly? I prefer the taste of store bought tortillas. I agree with Crystal.. and it is not all about just tortilla’s… it is with anything.. if it comes down to you are saving .50 when you can get basically the same thing.. why knock your self out over it? I love reading all the posts here with saving money for this or that.. BUT there is no way that I have the time to go to CVS and buy this and that.. and save this and that and get the coupons for the next time I go.. I have tried and I usually forget or lose that Money saving coupon for my “next trip” But that is just me..
My time is very precious to me, I am a full time working mother with kids.. so if we pick up a take out pizza once and awhile to give me more time with my family.. so be it.. But purchased with a coupon of course! I’ve fallen in love with the taste of “homemade” tortillas for tacos (don’t really like them for quesadillas) but won’t take the time to make them myself. My compromise is buying them uncooked from Costco. They come rolled out and all you have to do is cook them for 30 sec. on each side and they are to die for! They come $6.79 for 44 or $1.54 per 10. I can’t find them here for much under $2-2.50 per 10 pk. so it’s cheaper AND they taste better. YES! Those COSTCO uncooked tortillas are AMAZING! @Sarah, I guess I need to go to Costco when I am near one again! I almost bought some and questioned how good they’d be! Darn…hubby would be so happy. Thanks for the tip! I’m with you 110% on this one. Sure, I think homemade tortillas taste better than store bought. But (esp. as I work full time outside the home) I need to prioritize my limited home time for what is most important and valuable. Anyone have a recipe for low carb tortillas? @Mary, You could try using corn flour (google “make corn tortillas”) because they are usually smaller than flour ones. That in itself would make a lowER-carb tortilla. Couldn’t agree with you more except that it took me wayyy longer to make home-made tortillas. Sometimes, though, when I was out of money, time was a less expensive commodity when I was craving tortillas. I have made homemade tortillas several times but actually prefer store bought tortillas to homemade ones. When I have made homemade tortillas they turn out thick and do not wrap good at all (which is probably an error in the making process on my part). My husband and I decided that we prefer the store bought ones and also can find them very cheaply. A side note: When we had the thicker homemade tortillas with fajitas we ate half the amount that we did with normal store bought tortillas since the thicker tortillas filled us up faster…we still do prefer the store bought ones as we think that they taste better with our fajitas. I was happy recently to find some whole wheat tortillas at Costco that don’t have a mile-long ingredient list, and they’re a good price. I would like to try my hand at homemade tortillas, but haven’t yet! Ah, but you are forgetting another point – sunk cost. A brief example: let’s say you ruin your flooring with a spill (acid, molten lava, etc.) and you have to get new floors. If the carpet flooring will be $500 and the hardwood floor is $600, you don’t say “Aw man. I can’t get hardwood floors because it will cost me $600” because it really will only cost you $100 more than another form of flooring which you already have to get. I say that to say this: when we do tacos/mexican at our house, I am usually already spending 30 minutes in the kitchen cooking the meat, heating up the tortillas (corn & flour), chopping the lettuce & tomato, getting the sides ready, making sure my son doesn’t get into everything, etc. If I have to spend 35 minutes in the kitchen to work in cooking tortillas with the other prep vs. 30 minutes using the store-bought, then I am really only spending an extra 5 minutes. Don’t get me wrong, I buy the store-bought tortillas because I have never made tortillas at home and don’t have appropriate equipment to make them at home. I just wanted to give you and your readers another point of view on the whole “use your resources wisely” argument. (If you can’t tell, I am a CPA – hence the whole “sunk cost” jargon) I do agree with you that sometimes we go too far to save money. I agree; if you can multi-task when making tortillas then it’s a better ROI. I’m not too great at multi-tasking right now, though, with three children underfoot while cooking. It usually results in burned stuff! I have to agree with you–and sometimes you just can’t do everything. I’m a working mom, and I usually bake a couple of loaves of bread for our family each week as well as some muffins or nut bread and cookies when I can. I have some fun putting in the ingredients I want to these–e.g., flax seeds and sunflower seeds in the bread, etc. But tortillas? I’ve liked the ones I’ve made, and I like to make them every now and then when I have the time, but it’s just not all that often. Tortillas are not all that cheap where I live, but I often find whole wheat or multigrain on sale (and can combine sales with coupons), and they are pretty decent. I agree my daughter and I just spend and hour making them yesterday, they were gluten free which is why we were making them. But I was thinking about the time it took and was it worth it. Since we were just doing it for fun it was okay but I can’t see doing that every week! @Kat, Kat, how did you make them gluten free? My mom has celiac disease and I’d love to try to make something gluten free for her. What type of substitutes did you use? @Kat, I’d love to know, too! I have celiac as well! Too funny. I just made tortillas today. I try to buy them at the store to save time, but then I read the ingredients list and I can’t make myself buy them. The ingredient list is so long. When I make them all I use is flour, salt, butter, and water. I made them this morning when I had some extra time, then they were all ready for me to wrap into enchiladas tonight. I had to make my own tortillas when I lived in Thailand and couldn’t buy them. Had to . . . because I must have my Tex-Mex. They are NOT easy to make. Rolling them out was much harder than I expected. I’m sure if you had a special press it would be much easier. All that said, though, they are significantly more delicious! There’s just nothing like warm homemade tortillas! Now I sometimes buy a dozen for 1.99 (not frugal, I know) at a local restaurant if I’m craving that homemade taste. They’re so fabulous, but they just don’t last long! I love making things from scratch, because its fun, cheaper, fits my dietary restrictions, and often much healthier. Tortillas are one of the things I haven’t figured out yet… we don’t eat them often at all so I buy them. Pasta is another one of those things that fall into the category of way too time consuming to make from scratch… I spent 3 hours to get a single pound of spaghetti! I think homemade pita pockets are tons easier than homemade tortillas, but maybe I’m just weird like that! And I really want to try my hand at making pasta sometime — though I’m not planning on it saving much money. I just think it’d be fun to try! @Daisy, Try Tammysrecipes.com/blog, her recipes are great. @Crystal, Not sure if you’re still reading comments on this post, but I recently tried making pasta, using a borrowed pasta roller from a friend. I LOVED it! And, I don’t think it took me that long for the amount of pasta I ended up with (less than an hour total, and ended up with enough pasta for about 15 meals for our family). I used my kitchen-aid mixer to make the dough, and the borrowed roller to roll it out (I’m currently saving for one of my own!). I made a ton of it, and put the unused portion in the freezer, which has been delicious. I was able to make super healthy whole-wheat pasta, and it was way cheaper than buying the same amount of pasta from the store. However, I don’t think I would have had the same experience without having the roller. That saved tons of time! I make homemade whole wheat bread. I really don’t know if it is cheaper- it depends on what bread you are comparing it to. It takes a lot of time. But I make it because we like it and it is healthy. I feel good making it. That is usually why I make things from scratch. Because I like knowing what is in it and how it was prepared- and it usually tastes better. But to say I am making things homemade to save money- that definitely isn’t always the case! Well said. That’s exactly why I do homemade. @Renee, I agree. I feel better when I make things with love for my family, time doesn’t matter all of the time. Tortillas from scratch are pretty simple (use the flour tortilla recipe from Hillbillyhousewife) once you make them a couple of times you can do it in a snap. My husband RaVeS about them, so I make them w/love for him. @birthrightrose, I am encouraged to try again for my hubby! Thanks for the recipe info! I am going to check taht out! But I just like the taste of freshly made tortillas; on special occasions, I like to make them. But for Tuesday Taco night? It’s whatever I bought grocery shopping. I agree — my time has a value, and with a full-time job and 2 kiddies, free time has a very high value for me. I’m a recent convert to online grocery shopping for that reason — it doesn’t save me any money but it’s not much more expensive than going to the store, and it saves me precious hours that I would otherwise spend at the supermarket on the weekend. Those free hours are worth a lot more than the delivery charge. Here in Aurora, Colorado, there is a Carniciera (Mexican grocery store) just about everywhere and they have the best and freshest tortillas made daily for 1.00 a dozen. Can’t beat that. Homemade (from someone else’s home I guess) AND cheap. I bought the ingredients and tried to make them one day, but I couldn’t get the pressed thin enough and the shapes were hilarious. I’m going to invest in a tortilla press just because I can’t stand to have a culinary recipe outfox me. But, even after I master the tortilla, I will probably only make them on special occasions and stick to buying the ones at the Mexican grocery store for my normal meals. That’s how I feel about tamales. I made them for christmas this past year and they were AWESOME. But I’m in Houston TX so I can pretty much walk out my door and grab a dozen tamales for $5 which is way cheaper than the ingredients+time it would take me to make them for scratch. Still, I’m going to make them again this Christmas! OMG I made tamales one year and it took us 2 days. Total waste of time. I’d so much rather pay for them!!! We just started using the tortillas that come in the refridgerated section at Costco, that are uncooked. You just take them out, 30 seconds in a non-greased skillet, and you’ve got fresh, yummy, tastes like homemade tortillas 🙂 It’s the best of both worlds, and though more expensive than the cheapest of the cheap tortillas at the grocery store, I will pay for improved quality for these! Anyone want to share what their favorite few things are to make from scratch? Things that save you time and money? Hi Becky. Which mass freezer recipe are you using for the pie dough? It’s really tasty and freezes well. I use it for pot pies, quiches, pies, etc. In fact, I have two pumpkin pies in the oven right now. 🙂 If you try it, just make sure you have a really large bowl. I’m going to try a roaster pan next time. That is so true!! OUr time is value and that goes about all things in our day. ( I do make our own tortillas that is for different reasons) but I certainly can understand the time value that is a better value. We should break down many things we do or don’t do in our day and see if it’s worth our time. While this post is about tortillas, I don’t think it is “really” about tortillas. It’s about balancing our lives, time vs. money, and giving others grace when they chose to balance their life a little differenly than ours. @Angi, you are a wise woman. And I would add to your thoughts….giving yourself grace too if you don’t “measure up” to the ideal in your head or someone else. I think that one of the main sources of discouragement for moms today is guilt that we impose on ourselves that stifles who God has freed us to be! If Christ has conquered sin for me and God delights in me as his child, can’t I live in that freedom instead of beating myself up for the ways that I am not Mrs. Perfect Housekeeper? Do I want to save money? YES! (We are on a teeny tiny budget, working for a non-profit, and praying about a run for county sheriff). Do I want to fed my family well? YES! But first things must be first. And the LORD determines my first things! I don’t want my husband and 6-month old son to feel like mom is always on the computer – even if that is reading quality material and searching for deals and filling out surveys and and and….. I don’t want to trade my passion for mommyhood with an obsession with homemaking. Is homemaking important – YES!!! 100% YES! Feeding my family WELL? YES!!! But I remember reading once that “emotions make excellent servants, but terrible masters”. And maybe – just maybe – it’s a similar thing with homemaking. It needs to be an outflow of my love, not a distraction from WHO I was created to be. My passions must be Lord, Wife, Momma – in that order. Even making bread (which I love doing), must be under the Lordship of Christ. That this whole comment chain is about tortillas is kinda funny to me. Not sure what my “tortilla” is….but I am sure I have one, or many 🙂 Hmmmm….. I love this, Sarah. Thank you so much for sharing. I have to constantly be reminded about what really matters. @Sarah, “I don’t want to trade my passion for mommyhood with an obsession with homemaking.” I appreciate this comment so much! Thank you! Totally agree on the time factor! I’ve made my own tortillas in the past when money was tight. Tortillas at their cheapest are around $2.00 a bag where I’m from. But when you factor in the entire afternoon it takes to make them (a double batch) and then the huge mess it makes of your kitchen…they taste great but are not worth it unless you come from a family of tortilla makers and can do it neatly and efficiently. I can (and do!) make 8 tortillas in 15 minutes hands-on time. Once I let a package of bought tortillas sit in my cupboard for 3 weeks or more, and when they still looked edible I turned the package over and read the ingredients. I realized all those chemically words were the things that made them last so long, and I didn’t want to eat them any more. So I found a recipe, and I love it! The tortillas LOOK hilarious, but they taste oh-so-good, and I know I am not eating a lot of things I don’t want to. That is my reason, and I think it’s a valid one to take a little extra time for, but you are free to disagree! “To everything there is a season,” and if I had three little ones I might agree that it was not my season to make homemade tortillas 🙂 Thanks for the great post! I wholeheartedly agree with your sentiments Crystal. Time is the most important aspect when I look at what I’m doing. Great post and hopefully opens the eyes to many of readers on what being an economist really means. Keep up the great work. I totally agree with you on the time factor. But was the tortilla recipe yummy? I’ve always wanted to try making my own, only because fresh tortillas are soo good! You are amazing, I am in awe of how much of your food you make from scratch! You are (a very realistic) supermom, and I want you to know that you inspire me. Thanks for everything you do! I don’t know about cost, or homemade vs. storebought, but I’m really digging Mission’s wraps! I like the Sundried Tomato Basil flavor, and I make the wraps with meat, cheese, fresh spinach, broccoli slaw, and a drizzle of dressing. Soooo good! My preschool age kids love them too, and they’re a nice break from typical “kid” fare like hot dogs and chicken nuggets. You all so rock!!! I love all the comments. I want to learn how to make them myself. I got a press from Mexico, small but heavy. I have yet to use it and will hopefully get a chance if some of you will pass on your recipes. Jessica I will be trying yours this weekend. Thank you all. Crystal pass the recipe on if the reader won’t mind us having it. Thanks for posting your recipe. Does anyone else have recipes they love? I live in rural Alaska, and tortillas really do cost $7-8/bag. I already make my own bread because the already moldy bread at the store is like $3 a loaf (and yes, you can really look at the bread in the store and see bright green mold – yuck!). @Amber, I love, love, love The Pioneer Woman’s recipe. They’re amazing! If you get a tortilla press, that takes care of most of the hassle (and time) associated with homemade tortillas. @Abbie, This is so true! I DO make my own laundry detergent because I can make it in 10 minutes while the kids are coloring at the kitchen table. On the other hand, my husband does not work on his own car, because he is a tire manager at a tire and brake shop. He can buy a lunch for one of his mechanic friends and they will happily make repairs to his car. He has often times traded a $8 fast food lunch for $200 in car repairs. We don’t need to worry so much with what is working for everyone else. We need to be able to evaluate our own situation and resources and act accordingly. Here’s a compromise: Costco has delicious fresh (uncooked) tortillas in their refrigerated section. You just need to bake them at home, which is really easy with a non-stick griddle. And while I don’t remember who much they cost, I know that I have done the math and figured out that they are just slightly pricier than Costco’s regular tortillas! It’s about $6 for more than we can usually eat before the last few start going bad. And they do taste homemade. I make homemade tortillas and rotis(similar to tortillas), although I usually make the rotis more as we eat a lot of indian, so I make them about 1 to 2 times a week and it is definitely a learning process, I get so proud when actually turns out fully round. The more you do it though the faster you get at it, I’ve seen some skilled Indian women roll rotis out in a blink of an eye and they are perfectly round, hey but they’ve been doing it since they were probably 2, I know my son has been helping me out since he was that age trying to roll them out, it is definitely a learned skill. Oh and an well seasoned iron skillet is a must for these flat breads! To each there own….but there very well could be value in the time and effort when they taste delicious and ya do it because your family loves it and you love them…somethings you can’t put a monetary value on. Sometimes things like this hold value beyond the dollar signs….ya can’t be so frugal that you miss the “happy things” in life. Just wanted to say that tortillas are definitely more expensive here in the DC area. Occasionally the Mission brand go on sale for $1.99 at Harris Teeter, and I can get them for $1.00 with a coupon or even free with Super Doubles. As always, Crystal, thanks for the reminder that time is money! @Emily, I love your comment. Spending all this time for a pile of toiletries that you could afford anyway! That’s just a great way to put it. Although I don’t have kids yet, so I’m not missing out on time with them, there are a lot of important things that I’m missing out when I spend many hours/week couponing and shopping. And it’s all for things I could really afford anyway. I, personally, enjoy couponing and consider it a bit of a hobby, but even then, I use saving money as my excuse to spend way too much time on my “hobby.” There does need to be a balance. I totally agree. I only make them from scratch sometimes because my husband prefers them to the sweet store bought ones, but certainly not for the cost saving. The Mexican grocery store by our house has small round corn tortillas that cost 3.00 for about 75 tortillas. You can watch the workers making them through a window and the come out still warm. They also only have like 4 ingredients. It is so fun to try to order them in Spanish from the workers (because ordering tortillas is all I can do in Spanish, lol). I will never make homemade as long as these are available! I buy the Costco pack and split them with my neighbor! We just take turns buying them. There are 2 inner packages inside the main pack. The pack has to be used 21 days after opening and has just about exactly what we consume in 3 weeks. So it costs me about $1/week. My Safeway sells the pack of cook at home tortillas also for around $2 for the pack of 10. I, too, have had this dilemma about tortillas. I’ve WANTED to make them…for the HEALTH reasons. However, I just went w/the store bought ones because of the ‘labor-intensive’ nature of the homemade ones. I’ve recently found a happy medium. YAY!! Costco has all natural, uncooked ones (only 3 or 4 ingredients) that are in the refrigerated section. You have to cook them yourself, but that is a GREAT trade off for me due to the all natural ingredients. AND, they’re $5.50-$6.00 for 36 (large) flour tortillas. Not too bad of a deal…and they’re yummy! I tried making homemade tortillas when I first stayed home and they turned out AWFUL. I’ll try them again for the health factor with some different recipes. I have so much to learn about cooking. Is there hope for me?!? I love to bake/cook and have tried making tortillas from scratch-even taking a lesson and watching my father in law who is Hispanic and I swear moved so fast I missed something! He is an expert. I failed. I let dear hubby try them and promptly, I threw them literally off the back deck; a common expression in our house as we live on a large wooded hill…we actually throw things off the back deck on very rare occassions. We do even threaten to throw each other off sometimes LOL;o) So anyhow…I agree totally that TIME=MONEY. This is what I try to emphasize to my Mom about her collecting and keeping what I feel is junk. Ok, so now I am totally off topic, and moving into donating vs. yard saling…but I love your blog for this reason-others and you share and generate such a great brainstorming session! My Mom and Dad have wasted so much time hanging onto things and sorting, re-sorting and trying to sell them. I told them that after one try at the garage sale, just donate it. They do not need to put it “away” again. Someone somewhere needs it obviously more than they do and it minimizes that time spent sorting it. We donate here-we do not do garage sales at all. Our time is too precious and we are not in a good spot to sell much. We are located on a busy road, but our house is not seen from the road, thus our efforts for a sale are not worth it. I like the immediate feeling of the items being gone and touched once anyway. I like seeing some of the things and thinking how happy someone would be to get it who really needs it. Plus, it is nice when tax time comes. I’m a little late here, but in response to your post about your parents sorting and storing things for repeat yard sales – that is exactly what my father in law does!!! He goes to flea markets, collects things he feels are great buys and sometimes keeps them and other times puts them in his garage for his tag sale ever year!!! Too funny. My in-laws happen to be great gardners, however , and end up selling the off-spring of their plants at these tag sales and actually make more money on the plants than the other items so all is not lost. I don’t do tag sales either – I live in a condo and I’m not allowed due to the condo bi-laws. One year we took some things to my in-laws tag sale and only got rid of a few things and made a wopping $20 for 4-5 hours of our time. We make more money at our jobs and figured our Saturday mornings more valuable. I also prefer to donate things for the tax deduction. I also think Betty Crocker’s bagged cookie mixes taste so much better than my homemade. Is that wrong?! @Kimberly, LOL! I love to bake from scratch but the one “bag” I do use sometimes is the package of the plain oatmeal cookie then I add cranberries and chop up a chocolate bar and they are so yummy! Thanks for the reminder and encouragement about how valuable our time actually is! I would have to say that I disagree with most of the posts that I read. Someone stated that homemade tortillas are healthier than store bought and that was the first comment that I actually agreed with. Homemade tortillas are not hard to make and don’t take a lot of time. Maybe I use an easier recipe or I’m a master with a rolling pin, but I can make tortillas in no time at all (25 minutes hands on time, TOPS) and they taste so much better. Plus, like someone else mentioned, they are much better for you. I made them once on a whim because I ran out and didn’t want to go to the store. The whole wheat tortillas here are easily $3.99 per 8. I can make mine for about $1-2 for 12, so it is cost effective for me. I appreciate your point of view though. Crystal, thanks so much for your honesty! That’s one of the reasons why I love this blog! You put yourself out there, but know that the only ONE who is worth pleasing is the Lord God Almighty! Enjoy your time with the three precious littles in your life! Is there another little coming soon? I delivered my fifth just weeks after you delivered Silas and just found out I am pregnant again. Just thought we might be pregnant together again! Silly, I know. Guess I’ll just have to keep my eye out! Sorry for the rabbit trail! God Bless! Not yet, but we’ll see what God has in store. 🙂 Congratulations — and thanks for your encouragement! There have been numerous times that I’ve gotten the smaller tortillas for free after coupon. Why would I make them?! Just wanted to let you know how different the pricing is between states. In Oregon at Krogers the 10 package is $3.99. We go through 3 packages a week so it really adds up. Sometimes it seems like the stores figure out what is catching on and then up the price. I want to try using a press. Is it easier than rolling? I can’t roll due to carpel tunnel. Does anyone have a brand for the press that they prefer? They seem to be hard to find here but I will continue to check the second hand stores. @pat, I’ve had no luck with a tortilla press as it just doesn’t flatten flour tortillas well enough. It might work with corn (I’ve never tried since corn tortillas are way too cheap here for me to bother…and I don’t really care for them anyway). Even if the press were big enough to get the tortillas flat enough (and finding a press big enough is an issue in itself; I like mine to be about 9″ and the press I have is about 7″), just because of the way the gluten works and stretches, as soon as you remove the tortilla from the press, it shrinks. Ha. So maybe you can convince someone else to roll them out for you. 😛 I do most of the flattening and pull the tortillas every which way with my hands to get them to about 8-9″ inches before smoothing it all out with a rolling pin and that minimizes the amount of rolling I have to do. It’s still a lot of work, though. I understood the point of view. . . but I find myself in a different situation. I usually have more time than money. When you don’t have any work and you are at home with your child/children it definitely is worth making your own. Every dollar becomes precious and you not only can save a little, but it can be a great fun time to teach your little girl how to cook! Whole wheat tortillas are quite a bit more expensive around here, so I do make my own whole wheat tortillas occasionally. But for the most part, I buy the ones at ALDI, and skip all that rolling and frying! With 2 little ones, I’m doing good to get dinner made at all, much less making every ingredient from scratch! lol 90 comments on homemade tortillas!! well, count us in the “i ♥ homemade tortillas” category! sooo tasty, especially hot off the press slathered in butter. but we’re in a different category than many… feeding 10 on one blue collar income. and we like the taste of scratch-made goodies! it’s so easy to spruce up rice and beans by making one of our cheapest (and without forethought, most time-consuming) meals with homemade refried beans from dry beans, brown rice, homemade enchilada sauce, and homemade tortillas (and free-with-coupon cheese 🙂 talk about yum-o! when you’re cutting corners to save $$, that’s a meal fit for a king and a great alternative to the same-old-supper. buying store bought would raise the cost of one meal by $4 for us and that’s not always do-able. btw, ten or twelve years ago we invested in a vitantonio tortilla chef, an awesome product that presses and cooks the tortilla. no rolling required! press, flip, eat. ours suffered a fatal fall, but we hope to replace it soon. There’s nothing like a homemade Tortilla….and my Mom can make them in 15 minutes! But even better than flour tortillas are Homemade Corn tortilla’s, so easy, cheap and taste great (but you need to invest in a tortilla press). I would love to make homemade tortillas one day. The ones you find in the store have so much JUNK in them. When I do buy them it’s only from a health food store. LOL!!! i just made homemade tortillas tonight….we are using MFW and studying mexico. I agree, not a great way to save money. But tortillas just went up in price here and it was more like $1.50 for 10. instead i just buy corn tortillas, which are super cheap, and don’t have the long list of ingredients that I don;t know what they are and i make myself make them if we want them. However….i have to work on the recipe. they taste better to eat, but not better for burritos. I make homemade tortillas all the time- usually I can make a dozen in under 25 mins. They turn out awesome too. It’s easy once you get the hang of it, and so much better for you. Just tonight I was at the store and saw tortillas on sale for .89. I always pay less than $1. Anyway, I picked up two packages and thought to myself that I could probably save some money if I tried to make my own. I honestly have never had homemade tortillas. I am guessing I would love them. But thanks for giving me permission to keep buying them! I freeze them and stock up when they are a good price, so I never run out. I don’t think it will take long for me to apply this reasoning to the MSM surveys I’ve been doing this week … but, they’re still a bit novel at the moment. Thanks for this post! 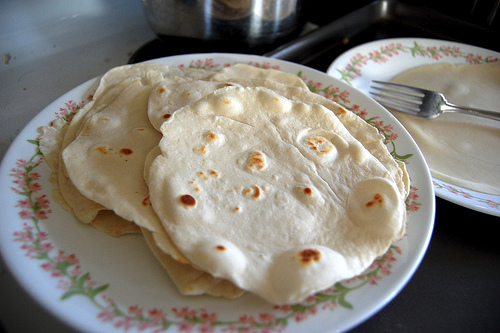 We live very frugally, and I read frugal blogs, but I’d felt a little guilty for not making homemade tortillas! I buy 10 per package at Aldi for $0.99, so I didn’t feel too bad, but still…I make other things, why not tortillas? This just seems like too much work and I’m officially letting myself off the hook now. Thanks, Crystal! I am Pakistani, (but born and raised in America) so I know how hard it is to get tortillas made fast! My mother in law makes rotis(our version of tortillas) in a blink of the eye. At first I was intimidted, but I kept trying and I think that if all of you make it a few times a week every week (which isnt hard to do if you think about it), you will catch the hang of it. I can do it pretty well now because of course, practice makes perfect. I agree from a previous comment about “our generation” not doing a lot of things, and taking the easy way out. I try and do things homemade a lot of the time, and I’m the only one I know that does. And I’m only 20! Wow – to buy ot make tortillas is generating such debate. That’s the amazing thing about this website – no stone left unturned. Personally, to make tortillas has never crossed my mind, as they can be purchased so cheaply here in the UK. A store always seems to have them on offer. Add to that the time factor in making them. The very benefit, I find, of shop bought tortillas is that they can be used to produce a fast and nutritious family meal. Only this week (Tuesday) I produced a Chicken Fajitas meal for four, adding red pepper, onion, and mushrooms to the meat. It literally took 10 mins to make from beginning to end, and that is what is needed for my children on school nights when you may not have the time to spend at your leisure in the kitchen. Saying all of that, now that the idea has been planted in my mind, I may just give making them a go as curiosity has bitten me now reading all of these comments !! I feel this way about beans. So many people are like buy bagged beans instead of canned. OK, but they have to be washed, sorted, soaked, and whatever, and by that time I can still buy a can of beans for like 60 cents and it’s maybe 10 cents more than an equivalent amount of bagged (around here). I really don’t want to use my time picking through beans when I could be doing something else. I never pick through beans. They are rinsed at the factory. The crock pot is a perfect way to cook them if you want no fuss home made. But, I’m with you. I generally buy store brand canned unless I am making a soup out of the beans or something. I agree that it takes way too much time to make them homemade. Unfortunately we’ve become addicted to the great taste of the homemade ones. So it looks like I’ll continue to waste time for a great taste. Make extra every time and freeze them. I have made my own tortillas, granted I thought they tasted awesome, they were a pain to make and did not come out round. I want them round, darnit! ;o) Someone commented above that they would want to make a bunch and freeze them. This was my original intention as well. After trying several batches here and there, I took hung up my sombrero. No more tortilla making for me, it’s too much work. Great idea in theory but I think unless you have a bunch of materials and people to make an assembly line, forget it. Good luck to those who try, I would certainly at least try it! I needed this post! Every week when I buy tortillas I feel guilty that I should be making my own. I laughed when I saw your picture because I can’t even get my pizza crust perfectly round and my tortillas would probably look like yours! @Liz, That’s funny. I can’t imagine feeling guilty for not making tortillas! 🙂 I can’t make pie dough to save my life! I buy them from the gourmet market made there. I can usually grab a package warm from the griddle for $2.00 for 10. It’s the best of both worlds. I hate making tortillas. (I think it’s a pain having to cook every tortilla individually.) However, the cost trade-off is much higher (at least around here) with whole-grain tortillas than with the plain white ones. And the storebought whole-grain can taste pretty nasty, too. Can you post the tortilla recipe? They looked really great. @Lindy Critchfield, I meant Crystal…sorry I spelled your name wrong. My MIL can whip out a batch of 3 dozen tortillas in about half an hour, but she’s been making tortillas everyday since she was 13 and now she’s in her 60’s. Sadly her arthritis doesn’t allow her to make tortillas anymore.It was her job in their family of 12 to make tortillas for breakfasts, lunches and dinner. They were a migrant farm worker family. She does complain frequently that store bought just doesn’t taste right tho. I’ve tried and tried to duplicate her tortilla taste and I just can’t get it right. Even when she’s standing right next to me telling me exactly what to do! So it’s store bought tortillas for us. I tried making my own tortillas and they didn’t turn out well and took a long time. I’ve also gone back to buying them, but I do make my own pita. I really appreciate this post, though, because I have been buying bread again some lately (I’ve been really busy) and I’ve given up on making my own yogurt, b/c it never got to be the right consistency and no one but me would eat it! That’s a waste of milk and it makes me sad! I have an awesome recipe if you’re willing to give it one more chance! I make it before I go to bed. 1/4 c. yogurt per 1/2 gallon of milk. Place clean mason jars on a cookie sheet without the lids. Turn oven to 200 degrees, place mason jars inside on cookie sheet (or baking stone) and ignore for a while. While the jars are in the oven, place yogurt in a bowl to come to room temp. Slowly heat the milk in a heavy pot. Stir often until milk reaches 180 degrees. Turn off stove and oven (leave jars in the oven for now). Combine about 1c. milk with the yogurt and whisk until smooth. Whisk mixture into the pot of milk and allow to cool to 110 degrees. Once cooled to 110, pour milk into mason jars. Wrap jars with a towel (I use one hand towel per jar), place back on cookie sheet and back into the oven with the oven light on and the oven door shut. What is this a recipe for?? Good thoughts, Crystal — and I agree. Tortilla making just isn’t for everyone. 🙂 Personally, I’m a big bagel maker, but I know other women think that is time consuming. To each their own! I didn’t read through every single post, but did anyone mention the tortillas you can get at Costco or Walmart? They are the dough and all you do is cook them before eating them. I agree, I won’t eat the store bought packaged ones either, except for Trader Joes, but those aren’t cheap. The Costco ones are our go to ones now, and worth every penny @ $6 for 36 large tortillas. Notes: I use half whole wheat flour, coconut oil, a jalapeno seasoning salt and then employ the dough hooks on my mixer for the mixing and kneading portion…take maybe 5 mins to do. I generally mix them up and ball them early in the day and let them sit, covered, till I am ready to roll and cook. I don’t refrigerate them or anything, just on the counter. Then cook them in a cast iron pan. They freeze great, wrap some in foil and pop in a freezer bag. This was just to give my recipe and tips on how I make tortillas. As everyone said their is a season and mine is…single working mom of a 9 y/o daughter and we both like to cook so whipping them up is a fun activity that we can do together and I like the way they taste better then the store bought ones where we live. I often wonder on the ROI of online surveys or scratch cooking or multiple store shopping and those are the things that give when I have less time. I actually don’t do multi store shopping anymore for several reasons, but 1) is I stocked up on good deals (a few years worth of body wash never hurt anyone) so now don’t have the need anymore and now have found that I would rather spend my that time doing other things, like cooking from scratch, then running to and navigating more then one store. ROI = Return on Investment. Is the return you get (money saved) worth the cost (time spent). For example, I used to frequent Wags to get shampoo, razors and the like for free or really inexpensively, but it was time consuming navigating the multiple translations and RR etc. Now unless there are several things that are free (or hot deals on things I need) I don’t bother going because it took up too much time for the amount of money I saved. Agreed! I work 2 minutes from a place that makes them from scratch and have a few grocery stores around that do too. They are so easy to come by. You know Crystal, with three little kids (i have three about the same age as yours) I’ve just learned that while I COULD save a TON of money by doing things by scratch, if I did it ALL, I would never have time to spend with our kids. We could buy them COOL STUFF with all the money i’m saving! But really, they just want US….to read to them, to talk with, to play games, to cuddle, etc. Yes, I do make a TON of food from scratch…but DEFINITELY NOT ALL! Life is not all about saving money….although we need to be good stewards–that is totally important…there are things in life more important. Thank you Jesus for the biggest blessings you give to us each day (which have nothing to do with finances or stuff)! Thank you for this post Crystal!!! I needed the encouragement. I’ve been getting so stressed and depressed listening to others that hand-make everything they use or wear and cook everything from scratch, rarely buying store-bought. They shop a ton of stores and catch all the deals every week. That’s just not me. I’m a wife, mom, and work 8-5 every day. I don’t have the time for all that. My 9 year old daughter is growing faster and faster everyday! She’s what’s important. Thank you for reiterating that time is money too! I tried homemade tortillas once – they were more brittle than storebought and wore out my arms rolling that tough dough! It took well more than 1/2 an hour to do all that. So not worth it in my book. But maybe I used a bad recipe? I can see where you are coming from, but being I bought two 50lb bags of flour for $4 each….I think that I’ll be doing homemade torrillias for a while before worry about which is cheapest. One of our local grocery chains sells a package of 80 count tortillas for about $1.50 . I think that’s pretty cheap! I have to disagree seeing as I’m out of work and haven’t been able to find ANY work. If I can save $1 or more an hour, that’s still money made. I know it’s different for those who work or blog for money or even have children to attend to maybe, but for those of us truly pinching pennies…it’s well worth $5 an hour–that’s the same as minimum wage after taxes. Have to make my own tortillas because the store bought taste and texture do not compare! Store bought are chewy, they’re soggy in enchiladas, and even have a kind of aftertaste. It takes me forever, but I make them only about once a month. You use flour tortillas in enchiladas? I’ve never heard of that. I’ve grown up with Tex-Mex and we use corn exclusively in enchiladas. Very interesting. Flour might be good for chicken enchiladas. Will have to try that. This is how I feel about most things related to sewing. But there’s always the satisfaction, for some, about making it themselves. I suppose some people felt that way about the tortillas. Homemade tortilla business anyone? We make flatbreads/tortilla at home. If you can make it the right way, it’s 10x better than the store-bought tortilla. With practice, you can also save time. With the store-bought packets, I’m always worried about the preservatives they use on the packaging. I try to avoid that as much as possible. A kilo of flour usually costs me only $1 where I live and I can make MORE THAN 20 tortillas out of it. You’ve made some good points here, Crystal. I am not sure if someone has mentioned this, but we love to buy uncooked tortillas from Costco. There are 44 for $7.15. They are so delicious and so easy to make!! Yes, it’s important to factor the “pay” for using a savings strategy. If I save $20 with a half an hour of work, that’s like getting paid $40/hr. If I save $1 making my own tortillas, but it takes me 1 hour to make them and clean up, my hourly wage is only $1/hr. I choose the activities that give me the greatest pay per hour and usually don’t have time for the others. Yes, I love that you brought up the fact that your time is valuable as well!! I am hispanic & grew up with homemade pinto beans & flour tortillas from scratch. It has taken me years (off & on) to try to get my flour tortillas to come out good. My family is ruined & they will not eat a packaged tortilla unless it’s the kind that don’t have the preservatives. They can tell just by sniffing them. lol! They are definitely time consuming so I don’t make them all the time like my momma did. Nothing beats an authentic homemade flour tortilla, so for me, it is worth the time it takes to make them. And pinto beans too. It is SUPER easy to put beans in a crockpot & let them cook themselves. For pennies you can have a whole pot of beans to freeze for future use! For me, it is also about keeping the authenticity of our culture (as was taught by my momma & grandma) going. i’d be tempted to make my own- mostly because I am allergic to wheat. Making my own as needed- that would, if not save money then at least make it so I can get tortillas as needed. Most the time however, with the cost of GF flour it doesn’t come in cheaper, when taking in account the whole time thing. I still may have to find a recipe and try it- because there aren’t always GF tortillas available where we are- and backups are good. You can find masa flour at Mexican stores for a cheap price. And the tortillas you make are so much better than store bought. Some Mexican stores sell them freshly made at the store. This is a great post. My husband and I are super busy and sometimes even though we could save dollars doing some things ourselves giving up our time with each other and the kids often isn’t worth the dollar savings. Time is money. ?? I don’t like the ingredient list I have seen on almost all store packaged tortillas. Like aluminum and so many strange additives and preservatives! Does aanyone have any ideas of a brand that’s more healthy and has not so many weird ingredients? Like a frozen or refrigerated brand? I’m more concerned about that than cost savings regarding tortillas. I’m mexican and I also make my own tortillas because I like to make them (and in Viena where I live you can’t get 8 for under 2$ ). Oh my! I wish I could find 8-10 tortillas for $1! I live in Wa and the cheapest deal I have been finding is 30 for $5.99-$6.99. And we go through tortillas like crazy! Family of six who loves them for quesadillas, chicken and beef tacos, enchiladas, wraps, and plain ? My mother in law has a secret recipe that taste amazing so we all prefer them homemade but only do it once or twice a year due to the work and the mess, but honestly if I catch him on his day off my husband will make them so I really should take advantage of that option more often! He has even taught our oldest daughter to help him roll them out and cook them so at this point I am actually wondering why I am not using homemade more often. I did see someone mention make a bunch and feeze them but that’s the one thing I don’t like about homemade ones is they only taste good to me when they are fresh. I just made tortillas from scratch, and I dunt think I will every buy store bought again. The taste is phenomenal. Store night can’t match. But hey, you do you. It took just a few minutes to make.